One thinks of Ghost in the Shell, Robocop, Blade Runner or Ready Player One while watching it. Yet it fails to capture any of those films' sense of wonder. In a post-apocalyptic world destroyed by a technological fall, Dr. Dyson Ido (Christolph Waltz) finds a disembodied core which he brings back to life and gives a new body. The cyborg, Alita (Rosa Salazar), awakens with no memory of her past, but she gradually discovers she was meant for something extraordinary. Based on the manga series Gunnm by Yukito Kishiro, the screenplay of Alita: Battle Angel was written by Laeta Kalogridis and James Cameron. Cameron was actually meant to direct the film, but kept getting sidetracked by Avatar, leaving Alita in development hell for years (the domain name "battleangelalita.com" was registered to Cameron by Fox around June 2000, so that shows you how far back this thing goes). Cameron eventually handed the film over to director Robert Rodriguez, known for such films as Desperado, Once Upon a Time in Mexico, Sin City and Spy Kids. Alita: Battle Angel doesn't feel so much like Rodriguez is inexperienced with sci fi as that he's so respectful of the genre that he doesn't want to change or put his own stamp on it. The resultant film does feel like a copy of a copy and fails to make a meaningful connection with its audience. One thinks of Ghost in the Shell, Robocop, Blade Runner or Ready Player One while watching it. Yet it fails to capture any of those films' sense of awe. It takes far too long to set the story up and its dusty, crumbly town setting feels oddly flat and hollow in spite of being so full of stuff and texture. Among the cast is Waltz, who seems content enough to be playing a good guy for once, and Jennifer Connelly and Mahershala Ali, who fully aware of the hamminess of their characters, go all out, embracing their comic villain statuses (one has a last minute change of heart which makes zero sense). Both look ridiculous and one is especially sympathetic towards Ali, who has been dressed like a cheap knockoff of The Matrix's Morpheus. In fairness, one area where Alita triumphs is in the design of the titular cyborg. Sci fi is typically motivated by the exploration of what it means to be human, and in Alita - brought to life just beautifully by Rosa Salazar - that theme is loyally adhered to. Alita is so penetrably real and emotive that it's easy to believe that she is meant to be extraordinary. At over 2 hours, Alita is far too long. The ending is set up for a sequel in such an overt way as to be more annoying than anything that preceded - and annoyed isn't exactly the emotion you want leaving the cinema. Even the action scenes aren't all that impressive, alternating between senseless explosions of CGI and varying degrees of violence as allowed by its PG-13 rating (sometimes there's a lot of blood, sometimes someone will be chopped in half and there'll be hardly any). It includes a bar fight which is particularly poorly choreographed and embarassingly obviously staged. 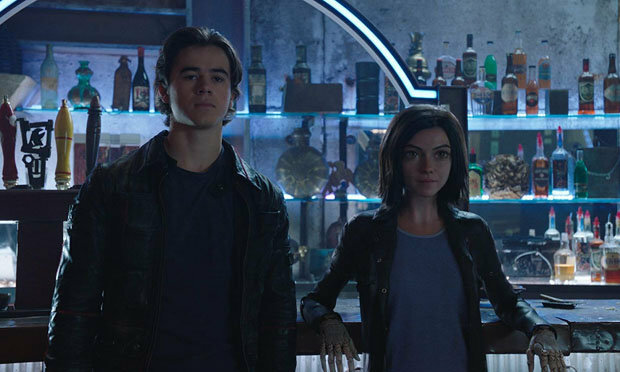 Alita's biggest disappointments, however, remain its inabaility to instil its audiences with wonder, and its perpetual hollowness in spite of what one has to believe are genuine efforts.